Tai chi is a bit like gardening. When you go to a chi gung or "energy" type class, there will be all sorts of little tips and tricks that you should do to ensure your "chi flows properly". I'm thinking here of things like making sure men circle their hands one-way and women another, or making sure you do your chi gung exercises in the correct order. 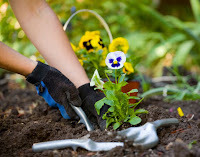 If you are a gardener, you will be aware that there are precise times of the year to do each of the pruning, watering, feeding, harvesting jobs for optimal planting. You can even take this to the extreme by taking account of the lunar cycles. Both however suffer from the same problem, that you just need to get out and do it. If you only go to one tai chi or chi gung class a week, which order you do your exercising is effectively irrelevant. Likewise, if you only have a restricted amount of time when you can do your gardening, just do what you need to at that time. It is important to try and understand what is important and what is merely "enhancement". Your tai chi will improve only if you do it every day, and at that point you can start worrying about all the subtleties. Just as your garden will look more beautiful, if you get out there every day tending to things just when they need it. If you only have limited time however, just concentrate on your breathing or prune like mad!